Hearthstone’s next expansion – the last of the current Year of the Raven – is called Brawl of Rastakhan, according to leaks from the official Blizzard Korea YouTube channel. Redditor MonetRain posted what appears to be a phone screenshot of that channel, claiming in the comments below that the Korean characters show a new playlist named ‘Hearthstone: Brawl of Rastakhan’, though they admitted the translation might be inexact. In particular, ‘brawl’ could translate to almost anything similarly pugilistic. MonetRain does point out that it’s unlikely to be a new tavern brawl, though, as the Korean translation of that particular phrase is different from what’s seen in the screenshot. The video and the playlist have been removed, but you can see the screengrab and Reddit discussion here. We’ve reached out for comment from Blizzard. God King Rastakhan is the ruler of the Zandalari Empire, a jungle realm of trolls which has been centre-stage in World of Warcraft’s latest expansion, Battle for Azeroth. 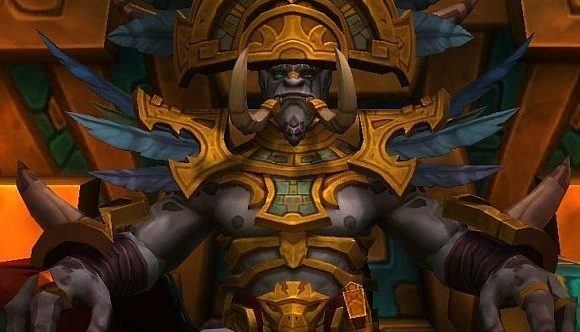 Rastakhan himself even appears as a boss for Alliance players during the new Battle of Dazar’alor raid, so a Hearthstone expansion featuring him would certainly be topical. With trolls a major presence in the world of Azeroth, a troll-based expansion has been a possibility since the beginning of Hearthstone. Speculation that it would finally be the tusky race’s turn escalated in February, when Blizzard teased the three expansions in the Year of the Raven. Many players felt that the war paint on the cover for the third expansion – which this will be – depicted the teeth and tusks on a troll’s lower jaw, as well as having a troll-like colour scheme more generally. This is all rumour so far, but it shouldn’t be long before we learn more. Whatever the next expansion is, you can expect a proper reveal at BlizzCon this weekend – last year’s Kobolds and Catacombs was teased beforehand, but fully announced during BlizzCon 2017’s opening ceremony.